Left: Kamal Talibzade, Literary Critic. Lately, there has been a strong attempt to purge the art that was created during the Soviet period in Azerbaijan. The term "Soviet Literature" for example, had almost became an expression of disdain and insult. Fortunately, we have very intelligent, reasonable people in literature and in other cultural spheres who are gradually correcting such trends. How can we eliminate Azerbaijani Soviet culture and the works of such great writers as Jaffar Jabbarli, Samad Vurgun, Hussein Javid, Abdulla Shaig, Uzeyir Hajibeyov and others? True writers or composers will always create genuine works of art whether there are dozens of Party resolutions restricting them or not. They'll think about the problems, the life and history of their people. That's why the writers who didn't create genuine works of art during the Soviet period are no longer being remembered. But those who did will always remain in the history of Azerbaijani culture no matter in what period or under what restrictions they lived. Not long ago, I spoke at the Jubilee of the late writer Mirza Ibrahimov. I presented an analysis of images and events in his play, "Hayat" which was quite different than had ever been discussed before. His play is about the struggle between the new socialistic trends and the old (pre-socialistic) world. Those characters representing the "old world" used to be interpreted as negative characters. That's the way we had to analyze them before. Today, we're beginning to explore these works from new angles and discovering that by creating "negative" heroes, the writer was trying to reveal reality and criticize certain elements of socialism. Ibrahimov's main hero is considered to be a positive character. She supports socialism. When we analyze her character more profoundly, we see how dependent and helpless she is. She never has her own point of view. She can't make her own decisions. She always follows Party resolutions. She is nothing by herself. She follows the newspapers every day to stay abreast of new Party resolutions. When her husband comes back after being away for a month, she tells him, "Don't get so close to me; people are around." So we see a true representative of the socialistic society-cold and aloof. If Ibrahimov had not been such a talented writer, he could never have depicted a Soviet woman like that. His talent kept him from lying. We were never able to emphasize these things before even if we had been able to see them. That's why our recently gained independence is such a great gift. We had been looking forward to this freedom for a long time because we were faced with huge problems. If we had not gained independence, the entire intelligentsia of Azerbaijan would have been totally Russified. There were only 12 secondary schools left in Baku that taught Azeri. There were attempts to eliminate all Azerbaijani departments in the universities, and writers were discouraged from developing university textbooks in Azeri. I used to be a true Marxist literary scholar, serving this ideology with great confidence. A week after the January tragedy when the Soviet troops attacked Baku (1990), I left the Communist Party with boundless hatred in my heart. Before that, I had always been loyal despite the fact that I could see there were a lot of shortcomings in the Marxist-Leninist ideology. For example, we always had to critique literature from the "class and Party principle" which meant literature should serve the working class and the ideas of Lenin. But when I applied this ideology to the Azerbaijani literature of the early 20th century, I could see that it didn't work. Jalil Mammadgulizade (Editor of the influential magazine, "Molla Nasreddin" in the early 20th century) and Alibey Husseinzade both served the nation. The first was considered a "people's writer"; the second, a bourgeoisie. "Class theory" didn't work; it couldn't be applied universally to all art and literature, but we weren't able to admit that before. Another example is a poem written by my father, Abdulla Shaig, who wrote, "We are all creatures from the same nest. We are all rays from the same sun." My father, who wrote these lines in 1908, was blamed for being cosmopolitan, and serving bourgeois ideology but his ideas were expressive of democracy and humanism, equating all classes. 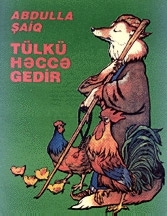 Above: Talibzade's father, Abdulla Shaig, who was educator and author of the famous children's story, "The Fox Goes on a Pilgrimage" ("Tulku Hajje Gedir"). Now there is no Party or State Resolution in regard to art and literature. The democratic aesthetic has been developing for centuries-since ancient Greece-and still exists today. We also rely on our own traditions in aesthetics, literary and critical thought. Before the State used to interfere even with our classical works. Publishing houses were required to cut sections from works when they didn't conform to "Soviet reality." The classical "divans", for example, contained certain sections called "minajat" where the poet addresses God at the conclusion of the work, and another section called "qasida" where he praises the Prophet Mohammad. These sections were eliminated from the works of Nizami, Fuzuli and other classical poets, despite the fact that they were penned centuries earlier. When I published the "Memoirs" of my father, they took out the chapter dealing with the Noruz holiday (Spring-March 21st). I petitioned the Department of Ideology of the Central Committee of the Soviet Party only to be told that Azerbaijanis had only one holiday-the Great October Revolution. I had no choice but to publish the book without that section. That was 1960. My father felt a lot of pressure as a writer and for no serious reason. People used the word "angel" when they referred to him. No writer celebrated his Jubilee as young as 40 [usually Jubilees begin at 50 or 60]. But my father was so dearly loved by his students that they carried him in their arms from his home to the Jubilee Hall. Actually, I think his "angel" character saved him from the Stalin Repression in 1937 because he had been a member of the Musavat Party which was the leading part of the Azerbaijan Republic in 1918-20 which opposed the Soviets. Most party members either escaped abroad when the Soviets came in 1920, or they were captured and exiled in Siberia. Also my father had written about 10 articles in the spirit of pan-Turkism. But it was when his brother, Akhund Talib Yusufzade, left for Turkey that he began feeling pressured. My father was a great educator and teacher. In some of his works written for children, we see motifs that can be appreciated by grown-ups as well. For example, in his work "The Fox Goes on a Pilgrimage" ("Tulku Hajje Gedir") the cunning fox becomes the symbol of the two-faced representatives of religion. Did he really intend such works for children or for grown-ups? I think both. Ten years ago they created an animated version of this story but soon the film was forbidden. Why? Probably because some leaders recognized themselves. It's very difficult to say what is happening in Azerbaijani literature today. It takes considerable time to assess the literary process. It's difficult to see these changes when we are in the middle of them. Ten years from now, we'll look back and assess this period more accurately. Generally speaking, I'm not aware that there is as much literary talent today as there was during the Soviet period. But there are still fine works being produced by writers such as Sabir Ahmadli, Isa Husseinov, Yusif Samadoglu and others. 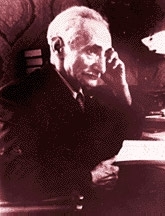 Movlud Suleymanli's work, "The Mill" marks the beginning of a surrealistic trend in Azerbaijani literature. In this work you find an analytical approach along with metaphoric expression. All the problems of the village become evident through the conversation of the people sitting together at the old village mill. Today is a very difficult period for writers, scholars and other professionals in the arts; they don't yet feel stability and certainty. Nor have they been able to find their places in the market economy. For example, up until recently, I had always worked in the Academy of Sciences. My salary was sufficient to live quite well and even to travel on holidays every year. But now I have to supplement my salary by teaching at one of the private universities. At the age of 72, this is the only way I can earn a living for my family. The Writer's Union no longer takes care of its writers. It used to be that they would assist in getting works published, help writers get apartment and funds. The building used to be alive with intellectual discussion. But most writers don't expect anything from them any more. Writers who manage to publish anything today do it through their own personal relationships. The main problem of Azerbaijani literature is that it has always focused on people and their relationships to society. During the Soviet Period, writers had to conform to the Soviet system. You had to describe his "happy" life in the Soviet society. They wanted all the writers to develop what they called "the realistic style." But a writer like Samad Vurgun was romantic. He was born that way, it was his nature. How could he have been a realistic poet? Let me give you an example of how such writers managed to succeed under such restrictions. My father had an epic poem, "Gochpolad," which described the national liberation movement in Azerbaijan in the 18th century. Back in 1937-38, he submitted the poem to one of the magazines which promised to publish it, but only after a year. It was Vurgun who advised my father to add a line using Stalin's name. My father was shocked. How could he add the name of Stalin when the poem was set in the 18th century? Eventually, he found a way to do so and the poem was published immediately. You see what kind of things were happening? Sometimes, I feel ashamed of the things that we had to do in the past. But we did it to survive. Samad Vurgun wrote 18 poems about Stalin. He saved himself and he also was able to help his people to a certain degree. Had he not done so, could he have spoken out against the Russian alphabet in one of the Supreme Soviet meetings? Could he have criticized the frequent alphabet changes in Azerbaijan? You have to understand the context in which we lived and worked, then you'll understand our pressures and predicaments and why our new-found freedom is so valuable to us. 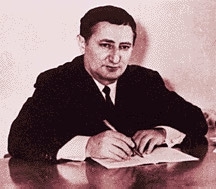 Talibzade is an Academician at Azerbaijan's Academy of Sciences and one of the best-known literary critics in Azerbaijan. For more than 50 years, he has been working at the Nizami Institute of Literature and has authored approximately 30 books and 300 scholarly articles. His father was Abdulla Shaig, a famous children's writer (1881-1959). Jala Garibova interviewed Talibzade for this article.